Our staff will personally greet you upon your arrival at out base in Road Reef Marina, Road Town, Tortola. Office hours are 8:00 am – 5:00pm, 7 days a week, year round. We only have one exception – there are no charter starts or finishes on December 25th so that our entire staff are able to enjoy the holiday. If you have pre-booked a sleep-aboard on your yacht and arrive after office hours our taxi driver will deliver you to your yacht, the lights and yacht systems will be operating and there should be a bag of ice in the freezer. We do have a security service in the marina from 6:00pm – 6:00am if you have any questions during the evening, however, he/she cannot assist you with any issues on the yacht itself. There are full restroom facilities in the marina and you should utilize these while you are at the dock rather than the heads/showers on your yacht. Your charter officially starts at noon, however, we begin briefings as early as 8:00am. There is a lot to cover and getting ready to sail off the dock takes longer than you may expect. If you are coming from a nearby hotel we recommend you be at the base no later than 10:00am to begin the briefing process. If you have had a sleep-aboard you may step into the office when you are ready to begin your briefings. You will meet your boat briefer outside on your yacht. So many islands to choose from but which one first? 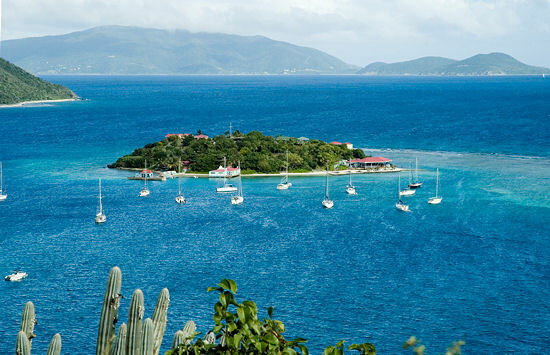 Probably your best bet for a brilliant introduction to the Caribbean is to go to Norman Island and anchor in The Bight. Here you will find the floating pirate ship “William Thornton” where you can have a beer or a body shot, depending on the mood you are in! There are also two great restaurants right on the beach, “Pirates” and “The Club”. Pirates restaurant has more traditional island fare and The Club specializes in an excellent tapas menu. Both are great places to hang out with your toes dabbling in the warm water and a frozen cocktail in your hand. There are some wonderful hiking trails on Norman Island and once you reach the top the vistas to the south are spectacular. Norman Island is reputed to be Robert Louis Stevenson’s inspiration for his book “Treasure Island”. Local legend agrees – apparently treasure was found here in the cave – enough to set the person up who found it as a taxi driver! A short beat up the Sir Francis Drake Channel takes you to Salt Island. Here you can pick up the National Parks moorings and either dive or snorkel the wreck of the Royal Mail Steamship Rhone, a relic of the hurricane of 1867 and famous for its part in the movie ‘The Deep’. Alternatively, go ashore and visit the settlement and salt pond from which the island takes its name. The annual rent for the whole island is a bag of sea salt which is paid each year directly to the Queen of England! After lunch sail to Cooper Island where you can pick up a mooring in front of the beach club bar and restaurant. There is an amazing rum bar, gift shop, a dive shop, and you can even purchase a delicious gelato or two! You may also want to sample a couple of Cooper Islands new home-brewed beers. Just to the south of Manchoneel Bay is Cistern Rock which offers some of the best snorkeling in the BVI. On any given day you will see squid, turtles, barracudas, and occasionally the odd shark. Sail to the Baths, one of the most unique natural formations in the BVI. Consisting of thousands of smooth boulders, some as big as a house, strewn along the beach on the southern tip of Virgin Gorda. You can explore the many gaps that open into massive rocky grottoes filled with sea water. Nearby is Virgin Gorda Yacht Harbour, with a full service marina, shops and restaurants. If time allows you could get a taxi to the nearby Copper Mine restaurant which sits on an old copper mine site. Alternatively from the Baths you can walk to the Top of the Baths restaurant for lunch, killer cocktails, and dip in their fresh water pool. If you decide to spend the night in Virgin Gorda Yacht Harbour or anchor just outside the harbour you can take a short 10-minute walk to an excellent restaurant on the beach called “Coco Maya” who serve up an amazing array of gourmet appetizers and entries along with extremely creative cocktails. 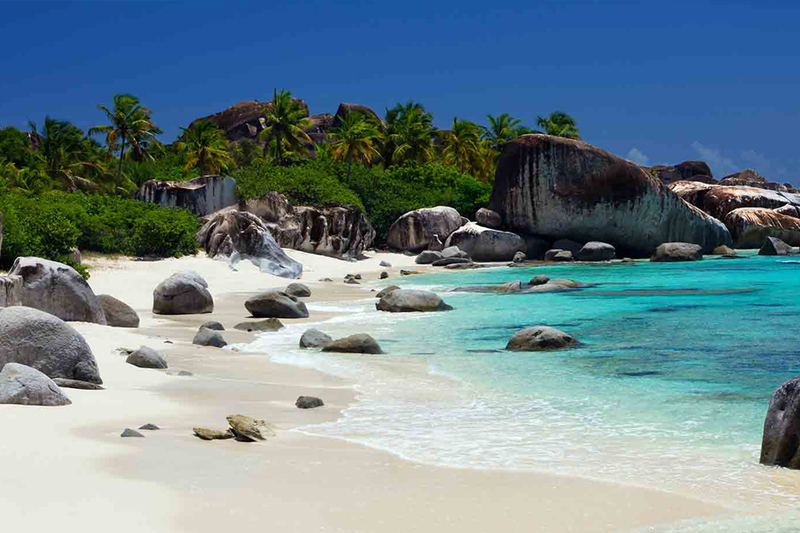 North Sound, Virgin Gorda offers a huge safe area of inlets and anchorages. 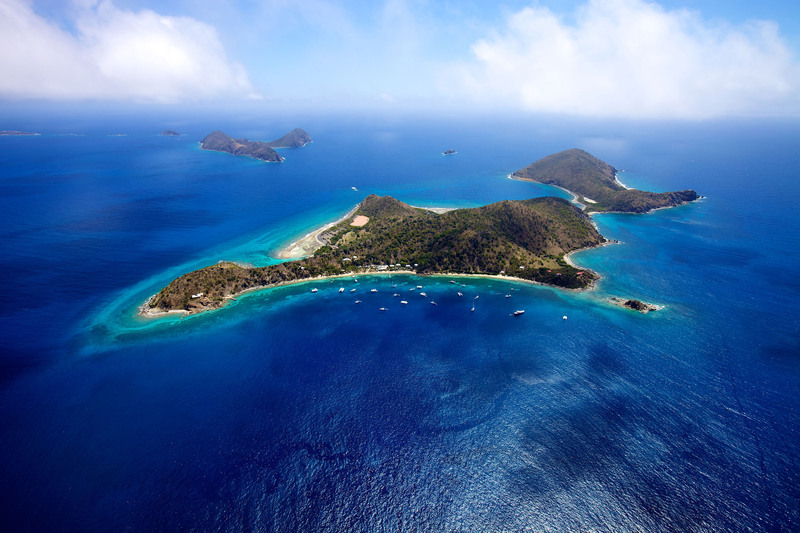 Whether you want to snorkel Eustatia Sound with its sunken canons and great reef fish, or spy on Necker Island this is the area for you. 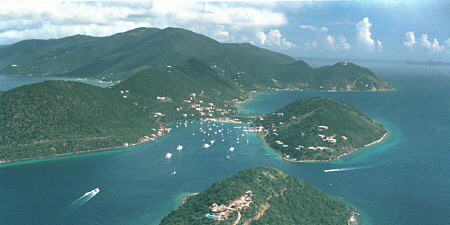 Bitter End Yacht Club, Saba Rock and Leverick Bay all offer good restaurants and transient dockage and gift shops. The Bitter End has some great hiking trails with amazing hilltop views both to the north and south. Both Leverick Bay and The Bitter End have provisioning stores and ice is available for purchase. Leverick Bay also has a Laundromat, which may come in handy right about now. Either relax and spend the day in North Sound or sail the 15 miles north to Anegada. Anegada means ‘drowned island’ and when you see it you’ll realize why! 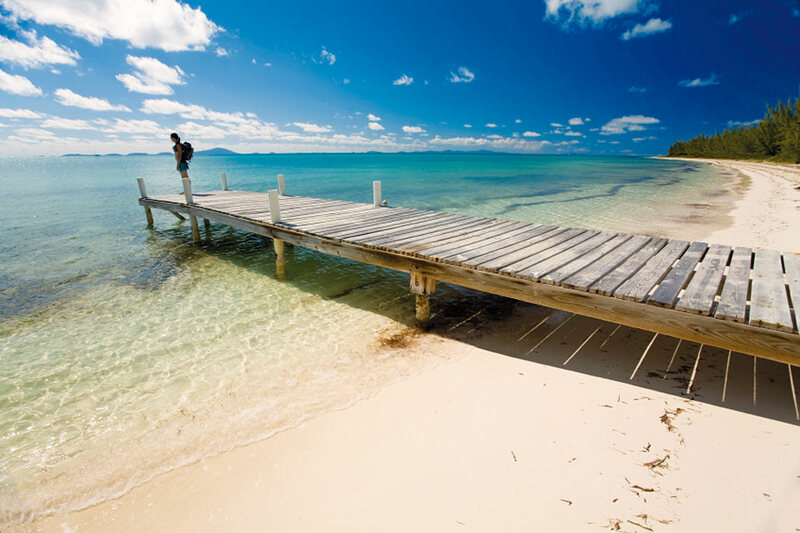 The highest point is 15 feet above sea level and Anegada is famous for its fresh lobster, iguanas and flamingoes. You will have to leave North Sound early in order to arrive at Anegada during the middle of the day. This will give you good light to navigate through the coral heads at the entrance to the anchorage. Once you arrive take a taxi ride, or perhaps for the more adventurous, rent a ‘scooter’ to Loblolly Bay or Cow Wreck Beach on the north side and snorkel inside the reef or enjoy a beautiful walk along the miles of white sand beaches. Anegada boasts the perfect conditions for kiteboarding and if you are not an avid ‘kiter’ you can always take a beginner lesson from Tommy Gaunt Kitesurfing located at the Anegada Beach Club. After an amazing day you can then head back to the anchorage for smoothies and a lobster dinner at Neptune’s Treasure or the Anegada Reef Hotel. Sail from either North Sound or Anegada to Trellis Bay on Beef Island, which is a well protected natural safe harbour. If you prefer a more tranquil spot then try Marina Cay across the channel to the north, off Great Camanoe, which features a Pusser’s restaurant that is good for happy hour and casual dining. A fun-filled Full Moon beach BBQ party, complete with real ‘moco jumbies’ is held monthly at Trellis Bay. Weigh anchor and take a short cruise up to beautiful Guana Island for spectacular snorkeling and a superb beach at Monkey Point. It’s a great spot to picnic. Then take an afternoon and sail west to either Cane Garden Bay on Tortola’s lush north shore, or to the island of Jost Van Dyke. 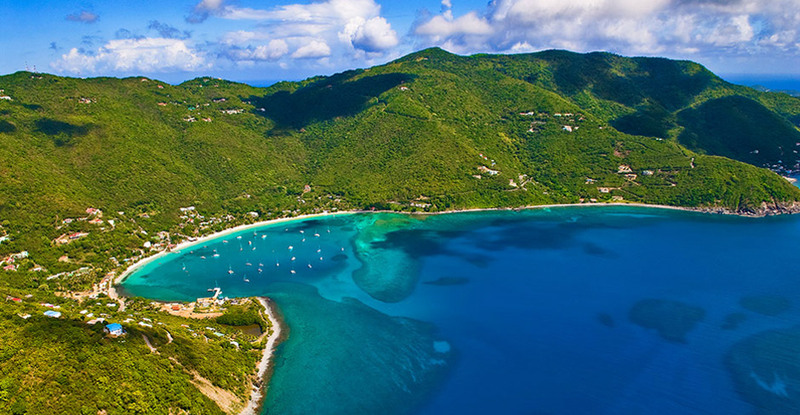 Great Harbour on Jost Van Dyke is home for the infamous ‘Foxy’s’, and Little Jost Van Dyke or Diamond Cay are also worthy of a visit. From Diamond Cay you can hike over to the ‘bubbling pool’ for some amazing photo opportunities and views to the north. This well-known pool is beautiful to see, but can be very dangerous if the north swell is running so please don’t be tempted to swim – better safe than sorry. All locations have good anchorages, beautiful beaches, hiking, beach bars and unique restaurants for your dining pleasure. Alternatively on day six anchor off of Sandy Spit and enjoy a swim into shore. You can walk around the entire island in five minutes, but snorkeling around is more fun. Then sail west to Soper’s Hole Wharf, the home of Pusser’s Landing, said to be built on the spot where Blackbeard the pirate once lived. Ashore there are restaurants, boutiques and provisions. For your last night, sail across the channel to Little or Great Harbour, Peter Island and enjoy some amazing snorkeling. 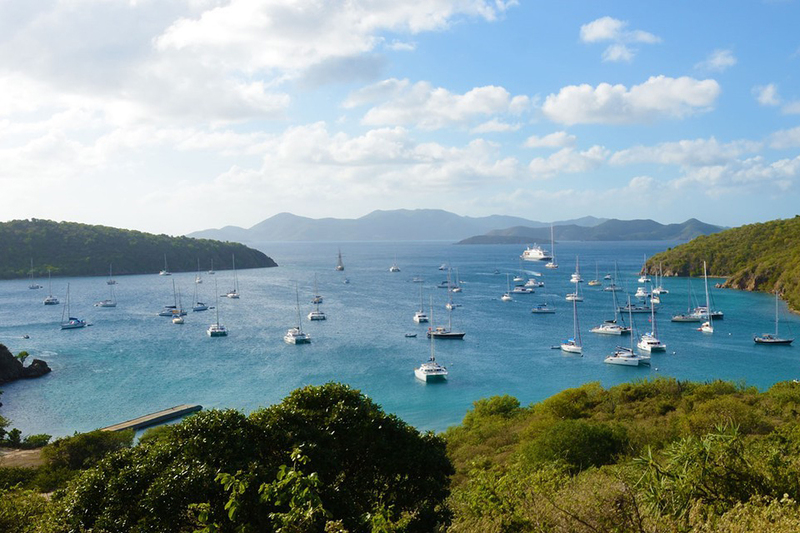 Enjoy the sunrise over the hills of Peter Island, take an early morning swim or sorkel and then weigh anchor for a short sail across the channel to the TMM docks. Now that was a week well spent! Your charter officially ends at noon so you should plan to be completely off your yacht on or before 12:00pm. You will need to be in the marina 1 – 2 hours earlier to complete the check-in procedures. You will call or radio the office on Channel 12 prior to your arrival and will then be instructed where to refuel the boat before returning to the marina and we will also give you a marina slip assignment. On docking, you are kindly asked to remove all garbage, linens, and food stuffs and perform a general ‘tidy-up’ of your yacht. When ready, you will do a final inventory check and yacht inspection with a TMM briefer. Lastly you will finish up in the main office to pay for any extra costs incurred and return your yacht WIFI and cell phone. We will then bid you a “fond farewell” and will look forward to seeing you the next time you are ready to enjoy another sailing holiday in our beautiful waters.